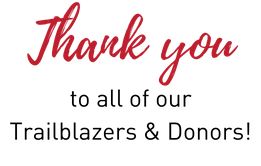 The Junior League of San Antonio is so grateful for each and every one of our 2019 donors to the Paving New Paths Centennial Campaign. Thanks to you, we will be able to help pave the path to mental wellness for all children in San Antonio! In the hiking world, Trail Angels are locals who are not actively hiking the trail but who serve hikers who are by doing good deeds, such as running van shuttles from the trailhead into the nearest town or leave snacks at certain stops along the trail. We want to especially thank our Trail Angels, who are those donors who have made donations of $500 or more to our Paving New Paths fundraiser.